By now you have heard all about patios for cats. These beautiful structures come in all types of shapes, sizes, and variations. Benefits from a catio are almost unlimited. Not only does your cat get some time outdoors without the dangers associated with roaming free, but she is also kept from harming birds and other small animals you may not want her stalking. Cats can get depression from being too bored, so the stimulation of being outside is very healthy for your kitty’s mental and emotional well-being. You can be outside with your cat if she is safely kept inside a catio giving you the chance to garden or read without feeling guilty for leaving your pet locked up indoors. If you do not have a catio right now or you are considering getting one in the future, this article is for you. One of the most fun and relaxing activities a cat lover can do is curl up with her kitty cat, a caffeine free tea and scroll through Instagram or Pinterest to view all of the jaw-dropping cat porches on the internet. Some of the architectural structures are simply astounding. 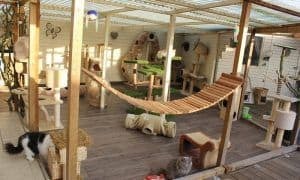 Everything from simple feline friendly window units and outdoor cat enclosures to magnificent towers with ramps for want-to-be lions to climb. If you don’t want to get caught up in the Instagram addiction cycle, the below handful of catios should wet your whistle for now. But cat lover beware! You may desperately want one after you see this lineup! Instagram Catios sure to make your cat purr! This incredible castle for cats was obviously built by cat enthusiasts who thought of every detail. Filling the cat enclosure are shelves for felines to lay in the sun, ramps for climbing and the entire space is surrounded with chicken wire for safety yet transparency. Any kitty cat would love to call this catio home away from home! Some catios are freestanding and not attached to the home. This enclosure is obviously spacious enough for a big cat scratcher and tall enough for the king of the castle to sit high and proud. An outdoor ecstasy! Lots of fresh air and sunshine is one of the top benefits of having outdoor patios for felines and this one sure hit the target with both. Not only can the pets enjoy time outside safely, but there is also room for a human or two. 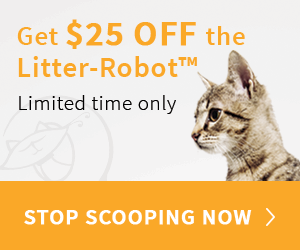 By the looks of all the cat furniture, the purr babies run the show! Air conditioners are not the only thing windows hold these days! Now window units are also filled with Fluffy and his toys. This design makes it super easy to enjoy bird watching without worrying about coyotes or the dog next door. Excellent color schemes can really make a cat enclosure look like a work of art! Adding cat-friendly plants is a nice touch! To have your own outdoor porch for your cat built, a catio specialist builder could you be right in your area. The best way to find one is word of mouth, social media, and Google. The builders for these cat enclosures are popping up more and more as demand grows. You can also obtain catio blueprints and build your own by contacting Catio Spaces. If you do not have the space or funding for a full project, consider a temporary portable catio that can collapse flat and store easily away when not in use. Lisa Illman is the inventor of an outdoor cat enclosure and founder at Kritter Kommunity. Lisa and her product the Kritter Kondo have been featured in Cat Fancy, the Chicago Tribune, Chestnut Hill West, Good Morning America and most recently Steve Harvey’s Funderdome. You can follow Kritter Kommunity on Facebook and Twitter @KritterKondo. Lisa is also a business and PR consultant and loves to help small businesses grow their brand. She has been featured in Entrepreneur Magazine, Forbes.com and the Philadelphia Inquirer. When Lisa isn’t growing businesses she is hanging out with her adorable tuxedo Finnegan. Contact Lisa at lisa@lisaillman.com. These 10 Amazing Catios Will Make You Wish You Were a Cat!